Last session, our in-house grooming specialist, Colonel Cator Sparks, gave us tips to on skin care. In today&apos;s lesson, he teaches us how to reduce body funk by using talcum powder. I know it sounds like something gramps uses, but Talcum Powder can be a lifesaver year-round for keeping sweat and stank to a minimum. What exactly is talc? It’s an extremely soft mineral used for absorbing moisture. It&apos;s often used on babies since they can’t dry themselves, but it&apos;s also used on cracks in hardwood floors to prevent squeaks. 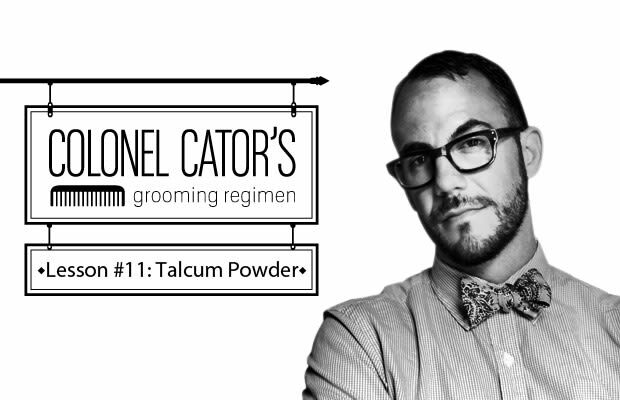 Talcum powder helps with anti-chafing and anti-wetness in the groin, in shoes, and between the cheeks. It’s also good for men on the furrier side to use all over their body since sweat/stank can build in hairy places. But please don’t go the baby powder route! We are men and don’t need to remind women of diapers and breast-feeding. Below are a variety of powders that are made with men in mind. Give a good sprinkle before sports, a hot date, or a wild night on the dance floor. NOTE: Always powder while buck-naked. You don’t want to shake into your shorts and cover your shoes. Also, don’t use an excessive amount of powder—I’m still in therapy for the time I went to the doctor and he had to feel around down there and a bomb of powder filled the room.